At Afforde Doors we're passionate about the work we do. We're a family run business offering top quality interior and exterior wooden and composite doors to both home owners and the trade. Founded over 30 years ago the business has supplied, fitted and maintained doors for hundreds of happy customers in a vast range of colours, sizes, finishes and styles. 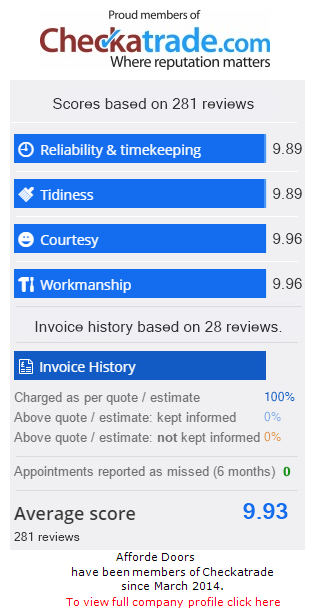 We are proud members of Checkatrade and pride ourselves in the quality of our work and our good reputation with our customers. We're pleased to see customers returning to us again and again as well as recommend our services to their friends and neighbours.